It’s February 1st! January flew by and it’s been since December I’ve posted anything about embroidery! Don’t get me wrong, I’ve been doing plenty in preparation for the big craft fair in April. I’ve designed a couple new napkin sets for the occasion based on feedback I had received during the holiday season. Many people loved the idea of having a themed napkin set, but for the most part, people didn’t seem dedicated to the concept of having all four match or two pairs in a set. What could I do for a theme? I started thinking about seasonal produce. Citrus and root veggies immediately came to mind. Citrus: lime, lemon, orange, and my favorite, grapefruit. Root veggies: red beets, golden beets, radish, and turnips. I’m in love with them, but what do you think?! Today is the final day before the Handmade Holiday Show at OPA! I thought I would take a moment to share one more post with you before the big day! As promised in my last post on Wednesday, I have something a little on the matchy-matchy side. To stick with the “what’s in season” category, I thought it only appropriate that pears should be included. 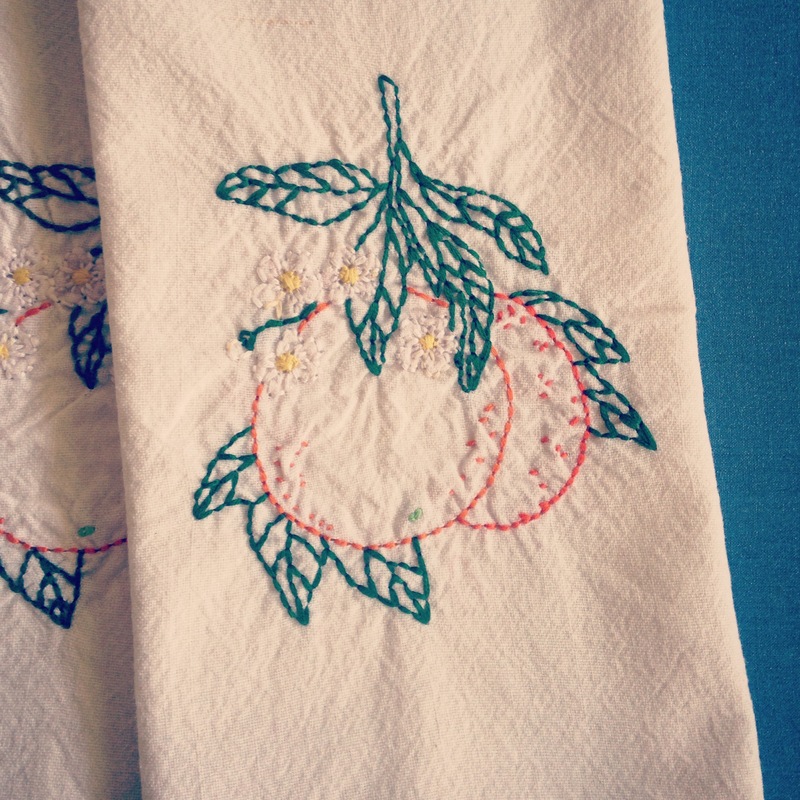 I will have pear embroidered tea towels as well as a pear canned good. I’m feeling somewhat mysterious this morning and thinking that I might not actually reveal what the pear canned good is… just to leave you hanging, curious, and inquisitive. Maybe you’ll feel so inspired as to come out tomorrow afternoon? Hope to see you there, lovelies. Orange is the new black. Alright, admittedly I’ve never seen the show, but it’s a pretty appropriate title, don’t ya think? Meaning to say…. Citrus is in season, baby! Not just actually in season at the local farmers market, but on my blog too! I thought it would be a great idea to have matching towels with the canned goods I have prepared for this Saturdays event! So, here it is Orange Curd and Orange towels! Woot Woot! For more info on Saturdays event at OPA click here! Stay tuned for what matchy, matchy things I have for Thursday and Friday! 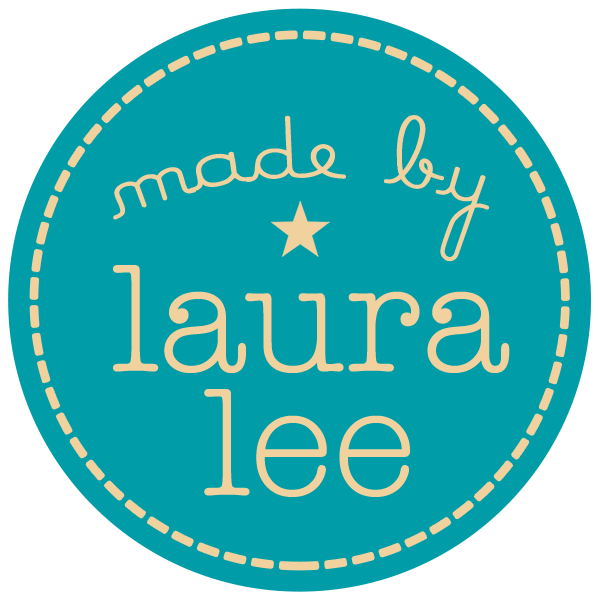 I’m excited to announce I have a new towel for this Saturdays Bluebonnet Bazaar. My herb towels were such a big hit in December, so much so that I decided that I would add more to my collection. 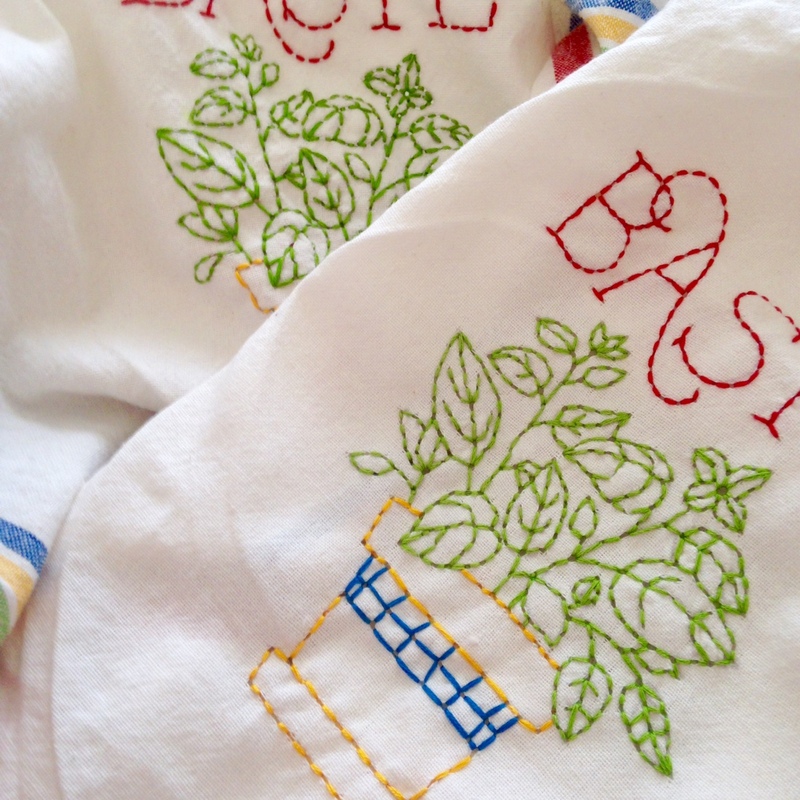 With warmer weather here Basil and Cilantro are making their appearance at Austin farmers markets, it seems only appropriate that they do in towel form as well! I’ve been pretty quiet on the blog and Facebook front lately. Sometimes the body and mind just need a little down time. I picked up an extra shift at work last week and, for whatever reason, my creative flow has been thrown off. Perhaps the colder weather and allergies had something to do with it… Or maybe a little rest and relaxation is what the doctor ordered. Either way, it was nice to have a few days of curling up in bed with my February book or snuggled up on the couch watching a movie. I find day dreaming always useful too. Daydreaming of new projects, taking a trip, falling in love… the stuff that the best dreams are made of. While falling in love hasn’t actually come true yet and my next trip is in the works (not until April though), new projects are the easiest to breathe life into. Embroidery is the most natural way for me to slip back into my creative rhythm as well. I’ve started another set of dinner napkins: peas in a pod. Simple, adorable, and a nice little item to check off my project list. As part of my day dreaming project list, I have had a little bit of an itch to get back into fine art. I had a day dream of having an art showing at a gallery space or coffee shop. 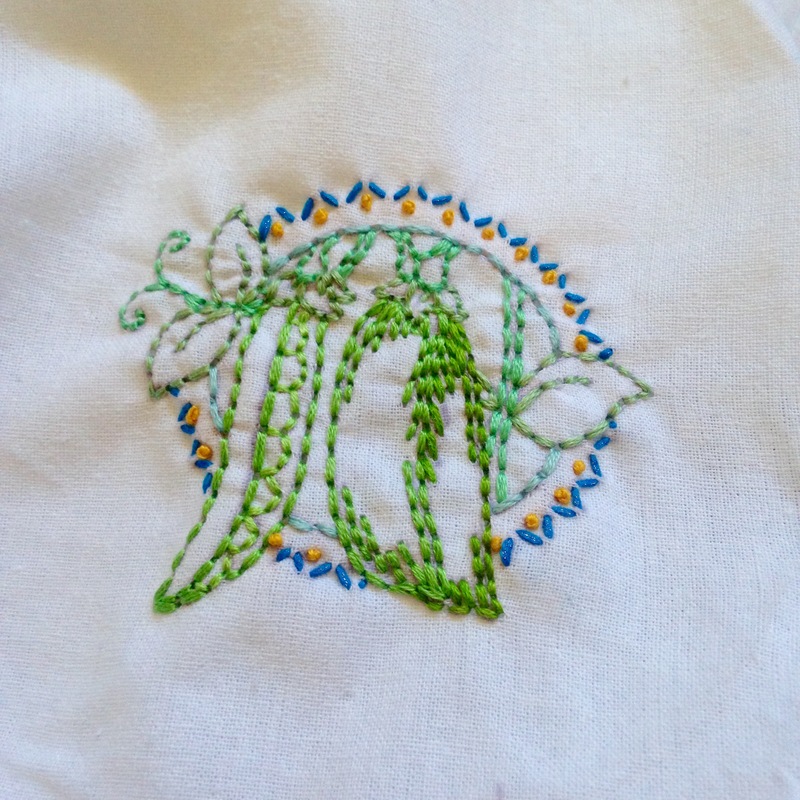 I know that embroidering vegetables on napkins is a long way off, but it is just one more thing to work towards. 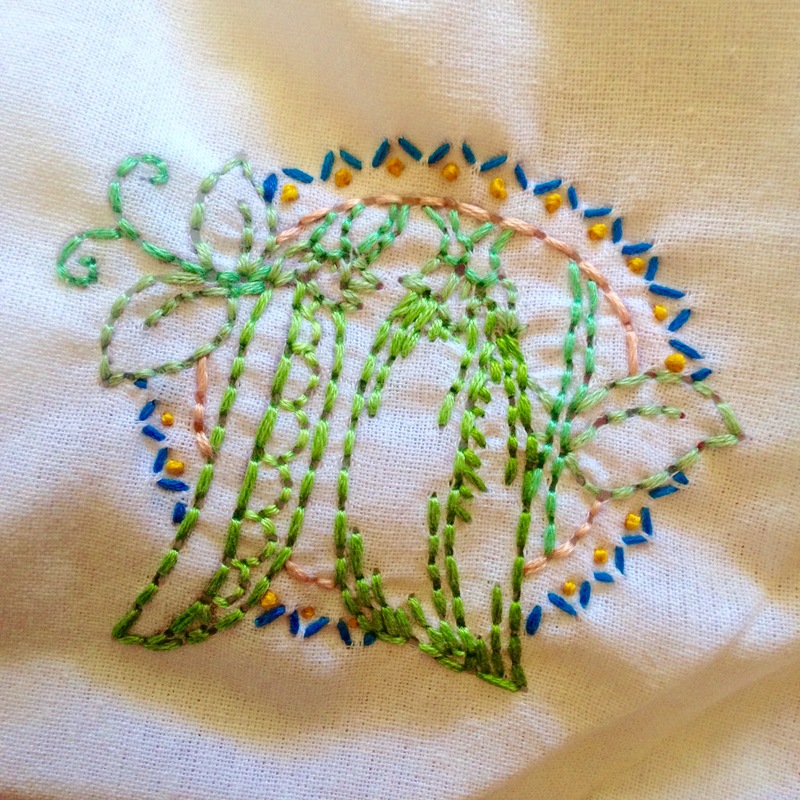 For now, I will keep stitching…. Today, I have been an emailing mad woman trying to get all sorts of events and gigs lined up for 2015. All my coffee started to set in and I got so wrapped up that I completely lost track of time and forgot that I hadn’t posted Day 8! Yikes! I will have lots of embroidered hand towels available this coming Saturday at the Bluebonnet Bazaar! Make sure to click through the slide show!